Yes, that's really us - even though it looks like we're ants. 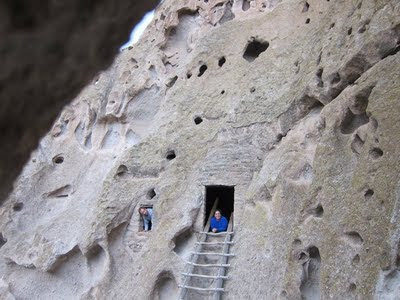 There are thousands of these "cavates" produced by voids in the volcanic tuff of the canyon wall and carved out further by humans. The area dates from 1150 -1600. There are so many cavates that were were allowed to climb into some as you can see. 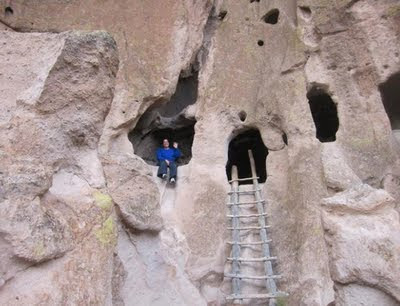 On Sunday, June 26, 2011 Bandelier NM closed due to a large wildfire that ignited today west of the park. The fire behavior is extreme and poses a danger to the park. The park will be closed until conditions are safe. The park website won't be updated again until the park reopens. I pray for the firefighters as they try work to protect N.M and other states from loss of life, protect homes, reduce threats like Los Alamos...and also protect National Parks such as Bandelier. For latest tweets, see http://twitter.com/#!/search/bandeliernps or the New Mexico Fire Information site.